Can good Algebra II students, using only the tools at their disposal, understand how decimal expansions of base-10 logarithms could have been found before computers were invented? Here’s a trial-and-error technique — an exploration activity — that is within the grasp of Algebra II students. It’s simple to understand; it’s just a lot of work. While I don’t have a specific reference, I’d be stunned if none of our ancestors tried something along these lines in the years between the discovery of logarithms (1614) and calculus (1666 or 1684). To approximate , look for integer powers of that are close to powers of 10. I’ll illustrate this idea with . Let’s keep going. We just keep multiplying by 3 until we find something close to a power of 10. In principle, these calculations could be done by hand, but Algebra II students can speed things up a bit by using their scientific calculators. We also note that this latest approximation actually gives the first two digits in the decimal expansion of . To get a better approximation of , we keep going. I wouldn’t blame Algebra II students a bit if they use their scientific calculators for these computations — but, ideally, they should realize that these calculations could be done by hand by someone very persistent. 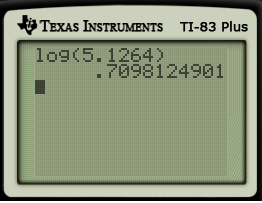 This last approximation of actually produced the first three decimal places of the correct answer! Now we’re really getting close… the last approximation is accurate to five decimal places.